Cherry Creek is one of the most elegant neighborhoods in Denver, featuring some of the best shopping and restaurants the city has to offer. Spearheaded by two major shopping districts, the upscale Cherry Creek Shopping Center and Cherry Creek North, the neighborhood is anchored by almost 500 different Denver shops, restaurants, cafes, and galleries that create a unique shopping experience. Here, you can hit the spa, find a specialty boutique, or visit one of the best art galleries in Denver. This Denver neighborhood got its name from the nearby Cherry Creek that runs through the south side of Denver. Adjacent hiking paths and biking trails are very popular. Streets lined with trees, colorful gardens, and the Victorian appeal of the best kept houses in Denver add to the beauty of the Cherry Creek neighborhood. Locals love how turn-of-the-century architecture blends right in with practical modern buildings and the convenience of urban living. Real estate in this Denver neighborhood features some of the most sought after and gorgeous Colorado homes. Many homes are luxurious mansions that could be featured in Architectural Digest. Nearly all of them have large lawns and well-kept gardens. The area is also home to some top-notch Denver schools and many parks that fill with families on the weekends. 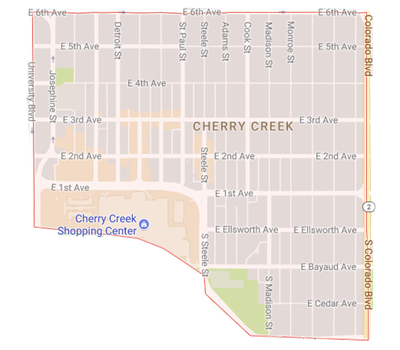 Cherry Creek is bounded by four main streets, making it easy to get around: University to the west, Colorado Boulevard to the east, 6th Avenue to the north, and Alameda Avenue to the south. Every 4th of July weekend, this Denver neighborhood hosts the Cherry Creek Arts Festival. The neighborhood transforms into a huge outdoor gallery complete with live music, food, and performances. Another popular community-hosted event is a five-mile foot race called the Cherry Creek Sneak that runs the streets and hiking paths of the neighborhood.